Social media has become an increasingly important communication tool for international universities and colleges to engage with millennials. Just a quick search on Google will show you that the rise in its use has been increasingly documented as we learn to harness its strengths and understand its weaknesses. On the other hand, the social media playground is always introducing new players to its team - each with different purposes, different functions and a whole new set of rules. For some marketers this can be a daunting prospect when attempting to identify which communication channels should be allocated time, money and resources. Being able to entice students by offering a more targeted and personal experience will absolutely improve recruitment success. With this in mind, your university’s international student admissions team should concentrate on providing an extremely high standard of customer service in order to give prospective students the very best experience. International student recruitment strategies must have an active presence on multiple platforms. This is particularly important when it comes to social media. For example, Chinese students are not overly active on US-based social media channels such as Twitter and Facebook, according to a recent report . On the other hand, Indian students are extremely reliant on these channels. 88% of social media users from India visit Facebook and Twitter on a daily/weekly basis, compared to just 22% of Chinese social media users. What method of communication is best for each stage of your international student ‘buying cycle’? We interviewed more than 1,000 international students who are currently researching higher education options through the International Student Admissions Service (ISAS). We wanted to know how international students would like universities and colleges to start an initial conversation with them. Having a phone call with a university was rated as the second most preferred method of initial conversation in our report. However, it’s also useful in following up with prospects. Questions can be answered instantly and the conversation can be extended to include parents. Strong alternatives are Skype and Live Chat tools. Both these communication platforms allow you to monitor when a student is online, and let you know they are available to have a conversation with. 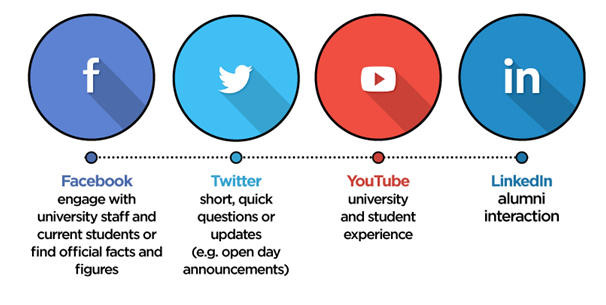 Social media is a great way to maintain a relationship with prospective and current students. This infographic by Hobsons demonstrates the different uses for each and why a student might visit a specific social media site. Finally, give students the opportunity to meet you in person too. This is a great way to begin early conversations with students in the initial research stages, and also provide more information to those who are already considering you.